OceanView resident Ruth Johnson was just featured on the WCSH 6 show “207” for her outstanding commitment to multiple volunteer roles. Reporter Rob Nesbitt did his best to keep up with Ruth, which isn’t easy, as “sitting still” seems to be quite the foreign concept to her! You’re truly an inspiration Ruth. Watch the segment below. 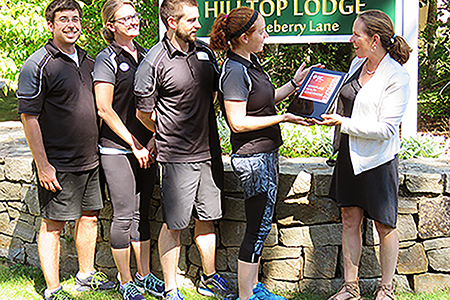 Left to right: Ross Schneider, Fitness Specialist; Shelby Poduch, Fitness Specialist; Jameson Skillings, Personal Trainer; and Kate Foley, Fitness Manager, accepting plaque from Katie Rooks, Go Red Director, from the American Heart Association. The 2017 results of the American Heart Association Workplace Health Achievement Index were announced, with OceanView achieving Bronze Level recognition for taking significant steps to build a culture of health in the workplace. The American Heart Association created the Index with its CEO Roundtable members, a leadership collaborative of more than 30 CEOs from some of America’s largest companies who are committed to improving their employees’ overall health. More than 800 companies completed the assessment this year. The new edition of the OceanViews Newsletter is HERE! View previous issues on our Newsletters Page or Contact Us to receive your own glossy copy in the mail. This September, OceanView will hold its second annual on-campus Walk to End Alzheimer’s. This month, our Legacy Legs team had a tasty kick-off to their fundraising efforts with a Gelato Fest! Gelato Fiasco of Brunswick, Maine, generously donated an assortment of gelato and sorbet. Flavors included Espresso Chip, Cookie Therapy, Dark Chocolate Noir, Madagascar Vanilla, and Wild Maine Blueberry – made with blueberries handpicked in Blue Hill, Maine, only a couple of days before! Gelato Fiasco staff member, Alisa, talked about the founding of this local Maine company, what gelato is and how it is made. For a suggested $5 donation, OceanView residents and staff lined up for the sinfully-delicious treat, perfect for the sunny summer afternoon. The event raised over $500 – an excellent start to our fundraising efforts in anticipation of the OceanView Alzheimer’s Walk right here on campus on September 26th! All funds raised directly benefit the Alzheimer’s Association, Maine Chapter. Masters on Display – Live at OceanView! OceanView’s Catering and Food Services Manager, Steve, had the idea to stage a painting centered around food. Renoir’s “Luncheon of the Boating Party” was chosen and OceanView residents Mabel and Didi took charge coordinating “models” and props! The “Display” was staged in our Gazebo, which sits just beyond the patio of our Gazebo Grille Café. Additional chairs were set up on the lawn to accommodate a large audience of residents who watched the scene come together, while enjoying wine, cheese and French music. It certainly was a fun and unique way to kick-off the summer. So what’s the next piece of art to be taken on by OceanView’s Masters on Display? We’ll just have to wait and see! OceanView’s First Resident Celebrates 100! Myron’s daughter-in-law, Sue Hager (left); Myron’s son, Bill Hager (center); Myron Hager (right); and OceanView Director of Operations, Maureen Connolly (standing). In 1986, Myron and Gladys Hager met John Wasileski, who was building a new retirement community called OceanView. The Hagers were the first residents to move in, with Myron becoming the first Chairman of the OceanView Resident Council. 31 years later, on May 26th, Myron celebrated his 100th birthday here at Falmouth House, which was decked out in a baseball theme. Boston Red Sox “tickets” showed the lunch menu which included Cracker Jacks, hot dogs and Maine lobster salad. John Wasileski was unable to attend the party, but gave a video speech from out of state, where he was attending a conference. Donna Brookings, Quilts of Valor Maine State Coordinator and a retired Falmouth House nurse, presented Myron with a certificate, recognition letter and quilt made by a group in Yarmouth for his military service (above). Falmouth fourth grade students, who participate in our Senior Teachers program, had stopped in the day before to deliver over 100 handmade cards to Myron! Residents, staff, family and friends sang “Take Me Out to the Ball Game” with Myron and shared pieces of a baseball field cake that was made by OceanView Dining Room Manager, Angela. “Slugger,” the Portland Sea Dogs baseball team mascot, paid a special visit to Falmouth House, bringing birthday wishes to Myron. Myron saw Slugger again that weekend when he threw a ceremonial first pitch at a Sea Dogs game, and the stands erupted with cheers! Happy Birthday Myron, and thank you for continuing to bring such kindness and joy to the OceanView community since our birth! Click Here to see Myron featured on ABC News! Click Here to see Myron featured on CBS News! The Summer issue of the OceanViews newsletter is HERE! Get your own glossy printed copy delivered to your mailbox by joining our mailing list. You may view previous issues on our Newsletters Page. OceanView resident Ruth was excited to discover that she was ranked 1# for her age category in this year’s “Orienteering North America” magazine! Orienteering is a sport in which individuals traverse a predetermined course over diverse terrain, using a topographical map and compass to navigate from point to point. Having taught physical education for 25 years, Ruth has been active her whole life. She first tried orienteering at a workshop offered by the Appalachian Mountain Club and discovered she liked doing it and was good at it. Ruth continued to participate in the sport all over America, as well as Sweden, Scotland and Canada. Forty years later, Ruth still enjoys orienteering, and has an impressive collection of plaques and medals on display. Ruth isn’t alone in her passion for the sport here at OceanView. Another resident, Tony, has been orienteering for over 40 years and designs some of the maps that groups use. Tony started an OceanView orienteering group and designs courses overlaid on our campus map! The group meets about 6 times throughout the year and has residents scrambling all over OceanView’s 80 wooded acres. At the Maine Family Business Awards Gala held this past Wednesday, OceanView at Falmouth was honored to receive the Environmental Leadership Award. The evening was hosted by WCSH-6 anchor Cindy Williams, who said OceanView was chosen for its many sustainable practices including recycling 95% of all generated waste, a robust composting program, and use of solar energy throughout its campus, making it Maine’s “greenest” retirement community. Presented by the Institute for Family-Owned Business in partnership with MEMIC, the awards recognize exemplary Maine firms that demonstrate excellence in family involvement, business success, and commitment to employees, customers and community. With 166 nominations, an independent panel of judges selected the 7 winners from among 20 finalists. We would like to thank the Institute for Family-Owned Business for this honor. We also are very grateful to our incredible team of employees and the residents they serve, we couldn’t do it without them. The Alzheimer’s Association, Maine Chapter, held a Volunteer Recognition Event this past Tuesday at the Maine State Capital’s Blaine House, where Legacy Memory Care at OceanView was delightfully-surprised with a Corporate Champion Award! The Association’s Director of Corporate Initiatives, Elizabeth Elliott (center), can be seen here with Legacy’s Sales Associate, Elaine DuMais (left), and Legacy’s Program Manager, Valerie Lamkin (right).